Hunter pitched a perfect ninth inning Friday to record his fourth save of the season in a 4-3 win over the Mets. The veteran reliever appears to be the closer du jour for the Phillies, picking up the team's last two saves since Pat Neshek blew a chance on Aug. 28. 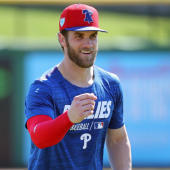 Hunter's 3.54 ERA and 44:11 K:BB over 56 innings on the season aren't particularly impressive, though, and his hold on the ninth-inning job is likely to be tenuous at best.